Colleges Nine and Ten have gathered over 700 student stories as part of their “Slug Stories” initiative - and there will be hundreds more to come. 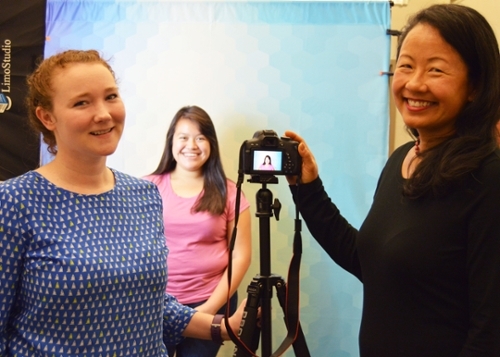 Academic Programs Coordinator Lori Schachle (right) and Colleges Nine and Ten Provost Flora Lu (left) have been documenting hundreds of student stories. Photo by Melissa De Witte. “This project became much more than a first-year experience program, it’s become a way for our current students to share personal narratives with peers, with alumni, with prospective students; it’s a way for our colleges to better understand our students,” says Schachle. Photo by Melissa De Witte. 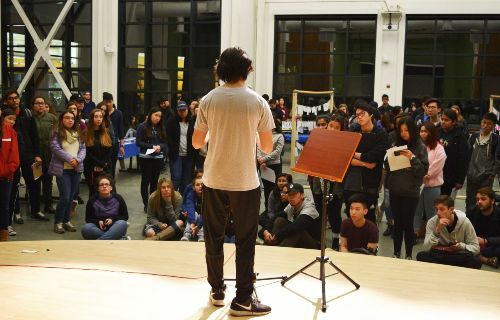 Colleges Nine and Ten hosted several open mic nights. These events provided opportunities for current and former students to connect and learn from each others’ experiences. Photo by Lori Schachle. “I had to be hurt to become the person I am today. I had to be torn open to release the darkness I was carrying inside of me. I had to take the time to heal, to be sewn up tighter than before in order to serve myself and others,” shares UC Santa Cruz undergraduate Marisa Degener on “Slug Stories,” a new multimedia digital platform for students in Colleges Nine and Ten. Degener is one of over 700 students who have shared their personal narrative on the “Slug Stories” website. Another 700 stories are soon to follow. 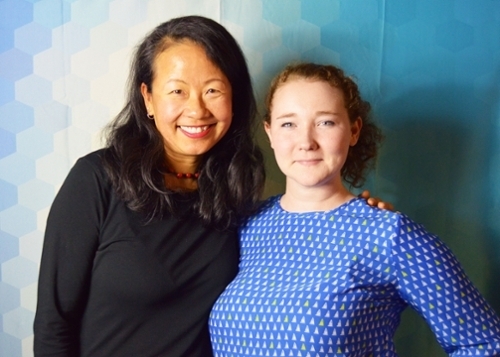 “Stories allow us to connect events that seem isolated into cohesive narratives that illustrate commonalities in the human experience and feed the potential for collective action,” says Provost of Colleges Nine and Ten, Flora Lu about the transformative experience of storytelling. When a story is shared, connections are made. Empathy is heightened. Friendships are forged. Trust is established. Community is built. Worldviews are shifted. Thanks to generous support from the University of California’s Office of the President and the Division of Student Success at UC Santa Cruz, Lu was able to develop the “Slug Stories” program which included a website and a series of events, story slams and open mic nights that provided opportunities for current and former students to connect and learn from each others’ experiences. “Slug Stories symbolizes that all of our students are part of the tapestry that is this university,” says Lu. Students upload their story (which they can chose to be public, private, or anonymous) and also learn about the people in their cohort: each story is tagged with a theme: acceptance, community, culture, diversity, expectations, family, feminism, immigration, independence, parents, perseverance, privilege, racism, stereotypes, and struggle are some of the subjects searchable via a wordcloud on the website. “Students can hear the stories of their peers, realizing that they are not alone in their struggles and challenges, hopes and trepidations,” says Lu. One of the stories in the Slug Story catalogue comes from Taylor Gravier, a Native American from the Yuki tribe of Round Valley. She talks about the racism she experienced as a Native American, and its devastating impact. She made decisions that she regrets to this day: she stopped wearing tribal regalia; she no longer said she was Native American when people asked where she was from; and she even stopped attending community events. “For the past year and a half I had been trying to fit in with society when in reality, society should have been trying to catch up to me and learn what my culture has to offer,” Gravier shares in her vignette. Also sharing his story is Mamon Alsalihy, who talks about selling snacks out of a duffle bag to his high school classmates as a way to help his family pay rent. Another story comes from Nimesh Poudel, who reflects on how hurtful microaggressions are and how he plans to respond to them in the future. There is also a story from Marisa Silva, who recounts how she deals with a chronic illness. Stories not only bring people together, they are also an important tool to realize one’s sense of self - an important part of the college experience. “Self-reflection is such an important part of who you are and where you can go in the future,” says Lori Schachle, the academic programs coordinator for the two colleges and project manager for the Slug Stories initiative. In addition to overseeing Slug Stories’ curriculum component, Schachle has also helped support social events for the program, including a faculty story slam around immigration, a staff retreat to cultivate awareness, an Alumni Weekend Story Slam, and several open mic nights that provided opportunities for current and former students to connect and learn from each others’ experiences. “From the beginning it was our intention that this program provided physical and digital spaces for students to share their voice,” says Schachle. “This project became much more than a first-year experience program, it’s become a way for our current students to share personal narratives with peers, with alumni, with prospective students; it’s a way for our colleges to better understand our students,” adds Schachle. Colleges Nine and Ten will host a Story Slam on Tuesday, December 5 at 7:10-8:30 p.m. in the Multipurpose Room at Colleges Nine and Ten. The Story Slam & Art Show will feature poems, photos, and other art from our international students enrolled in Multilingual Curriculum core in both College Nine and College Ten. While guests peruse art, several students will share personal stories live on stage. The art and stories were developed in the college core courses, which focus on the theme of each college (International & Global Perspectives at College Nine and Social Justice & Community at College Ten). Personal narratives featured in the Story Slam convey themes of perseverance, grit, struggle, identity, and significant life moments, in addition to the college themes.